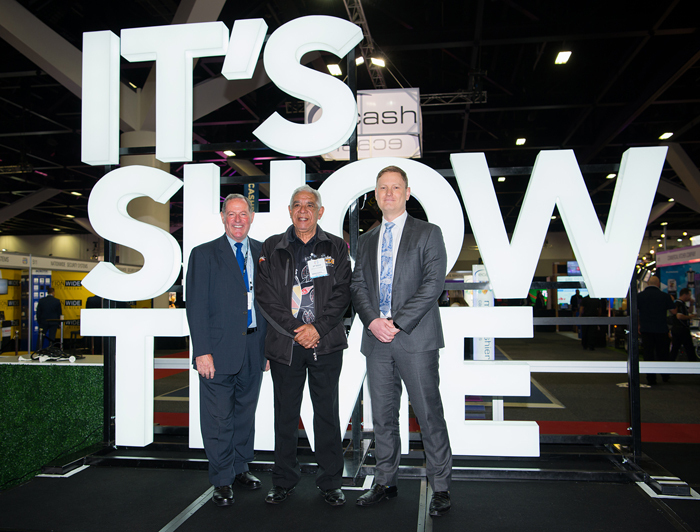 Left to Right Ross Ferrar, CEO Gaming Technologies Association, Allen Edwards who conducted a Welcome to Country Ceremony and Paul Newson Deputy Secretary, Liquor, Gaming and Office of Racing. 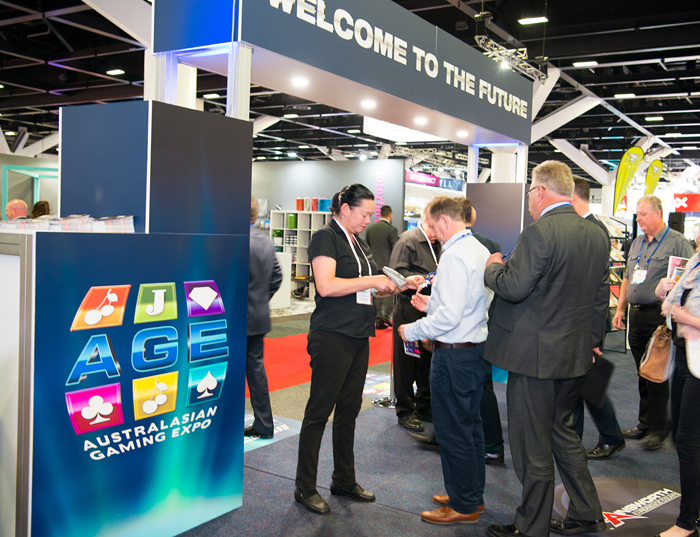 Over 3,000 key industry executives from the Gaming and Hospitality Industry gathered for the first day of the 28th Australasian Gaming Expo at the ICC Sydney at Darling Harbour. This year’s Expo saw 26% more exhibitors than last year, while the first day’s visitor attendance represents an 17% increase over the previous year’s attendance. What they came to see was the world’s best and latest gaming and hospitality equipment – and that’s exactly what they got. The event owners and operators, the Gaming Technologies Association, added to the fun by offering a trip for 2 to Las Vegas for each day of the Expo which on Tuesday was won by Mr Lee Cook, Group Gaming Operations Manager, Matthews Hotels, of Kent Town, S.A. The Association also presented a Best Stand award, which took the judges some time to decide. Based on a strict set of criteria, it was agreed that a number of exhibitors had excelled in terms of creative execution of brand identity and key messages; innovative and efficient use of space; simplicity of form and aesthetics; imaginative use of materials, colour and lighting; and most importantly, visitor engagement and interaction. 246 exhibition stands put in a huge effort to make the event a welcoming, entertaining and innovative exhibition showcase. Of these, the judges’ compliments were extended to Scent Central, Hennessy Coffee, Next ATM and Bromic. Last year’s winner Satelight, returned this year with an innovative lighting display, which also makes them worthy of a special mention. We also make a special mention of long term exhibitor Plantscaping Solutions, represented by John Dickinson. The Best Stand award winner for 2017 is Big Screen Video, on stand 953. This exhibitor maximised their use of the ICC’s cavernous ceiling height to bring a “wow factor” to the show, with Ross Ferrar presenting the award to Big Screen Video’s, Mr Paul Ellery. Visit http://www.bigscreenvideo.com.au/ for more information about Big Screen Video. The exhibition concludes this Thursday 17 August at 3pm and visitors can register at the event. For further information call the Gaming Expo Help Line on 02 9211 7430 or visit www.austgamingexpo.com. Next Post Returning to Darling Harbour and the ICC Sydney is a Winner for AGE 2017.